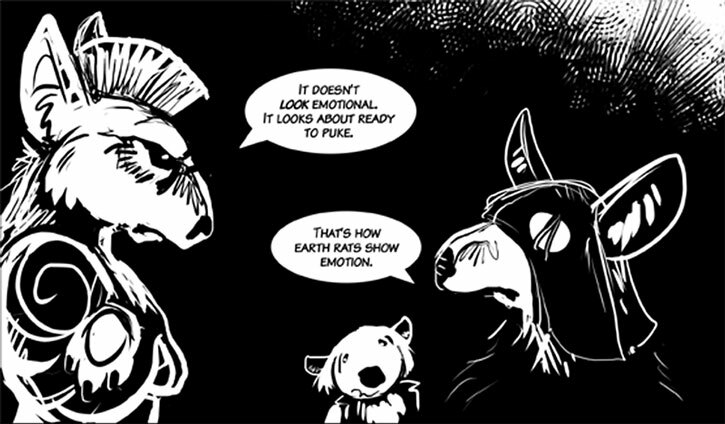 Boneclaw Mother is from the excellent (and finished) webcomic Digger. 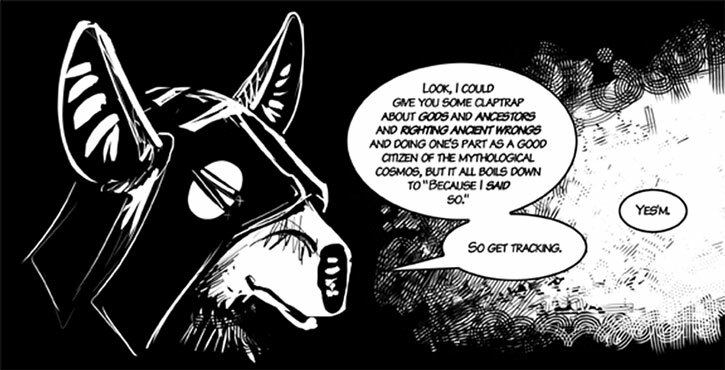 For context, see our Digger the wombat character profile. This profile has S P O I L E R S.
Known Relatives: Grim Eyes (niece), Digger-of-unnecessarily-convoluted-tunnels (adoptive daughter). Group Affiliation: De facto leader and head priestess of her tribe. Base Of Operations: Her tribe’s camp in the Cerulean Hills. Height: 5’1” Weight: 90 lbs. 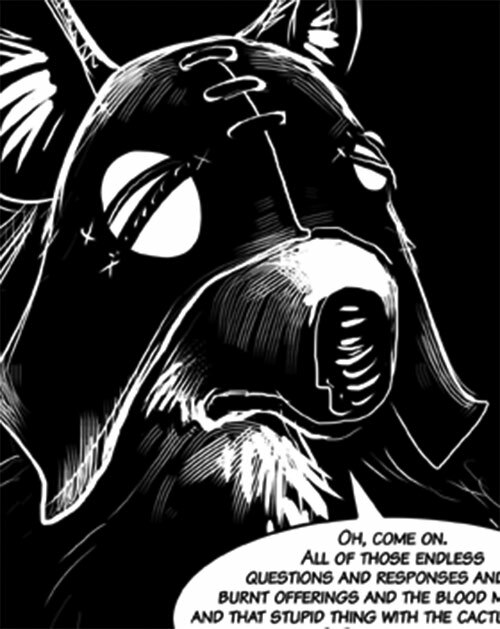 Boneclaw Mother is a sapient humanoid hyena. She is very aged and was apparently wounded several times in her life. She is also completely blind and has to use a cane. She mostly orients herself through sense of smell. However, she is wickedly smart and perceptive, and incredibly good at imposing her authority. She excels at uncovering people’s motivations and values, then ruthlessly using these against them to have them dance to her tune. She’s also a highly accomplished liar. And Mother has no qualm against leveraging her frailty and handicaps against her opponents. Arguing with Boneclaw Mother is practically guaranteed to result in catastrophic defeat. Then feeling compelled to carry out her agenda and wondering what the hell just happened. Boneclaw Mother once had her claws coated with contact poison for a specific plan, but this wasn’t used. Thus, how dangerous the poison was remains unrevealed. The poison was provided by an old male hyena called Owl Caller, who’s apparently the doctor and chemist of the tribe. He and Boneclaw Mother seem close. The hyena people of the Cerulean Hills are a small Stone Age tribe of hunter-gatherers. They live in a camp made of wood and hide huts. They are primarily armed with wooden spears with a flint head, which they mainly use to hunt deers. There apparently are 30-ish adults among the tribe. Like spotted hyenas, they have a matriarchal society. Females are significantly larger, stronger and more aggressive than males. Males mostly play ancillary roles while females handle war, hunting, politics and other prestigious work. The hyena people have a rich mythology, with their oldest tales being concerned with She-Is and He-Is, two primeval hyena-people-gods. One of the core She-Is and He-Is tales is a mythological explanation of why the first-born child of a female hyena is nearly always stillborn. Like actual hyenas, hyena people have a complex social organisation. Theirs is about bloodlines, prestige and face. It has a certain emphasis on acquiring as much meat as possible to live comfortably. Hyenas are proficient huntresses. They operate in small crews for most prey and communicate over large distances via whoops and other hyena noises. They rely on smell at least as much as on sight both in hunting and in everyday life. They have numerous rituals and ceremonies. These include ritual cannibalism. When a huntress dies, dignitaries will eat her liver (which is considered the seat of strength and soul). The rest of the tribe will eat her body, so that the strength of the deceased can return to the tribe by imbuing their liver. Such proper funeral procedures are very important, lest the deceased becomes a non-person in the afterlife due to a lack of proper honours. Boneclaw Mother is the oldest and most authoritative member of the tribe. Though the tribe is technically ruled by a council of elders, the other old women know that arguing with Boneclaw Mother is like fighting a boar using a twig. Boneclaw Mother is also supported by the tribe’s hunt-leader. This is a strong and competent huntress named Grim Eyes. When the wombat Digger-of-unnecessarily-convoluted-tunnels accidentally came to the Cerulean Hills, her first encounters with Grim Eyes were hostile. However, during a brawl on Lady Surka’s bridge, Digger saved Grim Eyes’ life. They became allies. When Digger was chased by armoured killers called the Cold Servants, Grim Eyes and a hunting pack of hers volunteered to delay the pursuers. One huntress named Skull Ridges was killed by the Servants. Digger narrowly killed the Cold Servants. However, that prevented the hyenas from avenging Skull Ridges, imperilling her status in the afterlife. To ensure Skull Ridges’ status in the afterlife, Boneclaw Mother adopted Digger as her daughter. Thus, Skull Ridges had been retroactively avenged by a member of her tribe, and the funeral ceremonies could take place normally. 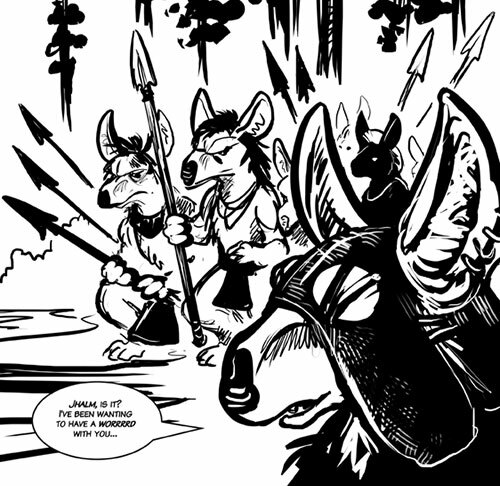 Though there was a lot of grumbling about Digger not being a hyena, Boneclaw Mother convinced, manipulated and/or strong-armed everyone (including Digger) into going straight for the final ceremony. Albeit Digger was very sick (wombats cannot digest meat), it went swimmingly. Boneclaw Mother also used her theological knowledge to argue that wombats were related to a hyena goddess, Mother-of-Earthquakes, and thus okay. Now cousins, Grim Eyes and Digger continued working together. Thus, when the Veiled temple guards started making life difficult for hyenas, the huntresses asked Digger to facilitate a negotiation. The negotiation could not take place due to an unrelated crisis. As a result, Digger had to call in the hyena tribals to stall the Veiled. Knowing that the hyenas would not fare well against the Veiled, Bonemother Claw tricked the Captain of the Veiled into talking with her. She used his moral principles against him, convincing the Captain not to order an attack. As the story concluded the Veiled guards chose to leave the area, allowing the hyenas to resume their usual activities. Boneclaw Mother wears a leather hood with two flat-ish pebbles sewn over her dead eyes. Her ears are pretty much always up, presumably because it helps with her orienting. Boneclaw Mother is a trashy, pragmatic, ruthless, intellectually flexible, salacious old woman. She’s mostly concerned about keeping her tribe running smoothly, which she achieves by being in charge as much as possible. She’s old, influential and wise enough to realise that most societal rules are an idiotic waste of time. But these are the source of her power. Thus, in front of the rank-and-file she has to keep the appearances up. Likewise she wields religion as a way to enforce obedience, but nevertheless respects the myths. Yet she knows that the less the gods actually get involved, the smoother life goes. Though she’s very goals-oriented, Boneclaw Mother stands for justice. And she works hard to spare her flock any unnecessary suffering. 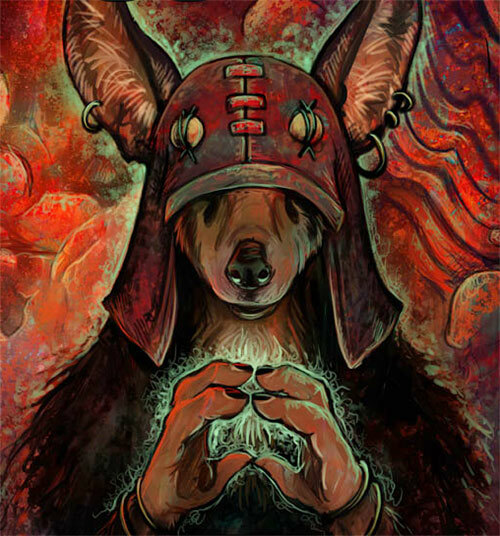 Credentials (Her tribe, Medium), Expertise (Hyena mythology, Hyena traditions). Grim Eyes (High), Owl Caller (High), Digger (Low), Lady Surka (Low). Age (Old), Creepy Appearance (old age and distinctive hood), MPR (very aged), SPR (blind), Misc. : Mother’s body mass is 1 AP. 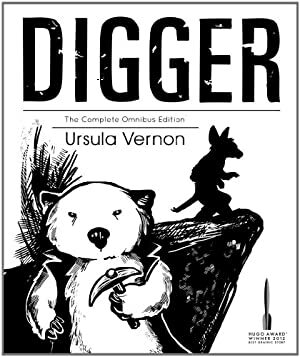 Source of Character: Ursula Vernon’s Digger comic. Writeup completed on the 7th of October, 2014.